Log A big pink Bob-omb that explodes after 4 turns. That explosion is big, so take it out before then. That's a Bulky Bob-omb. I think it's like other Bob-ombs... but it's huge! Max HP is 6, Attack is 2, Defense is 1. It's weird... It never attacks, but once its fuse is lit, it'll blow up on its own eventually. I don't mind it taking itself out of the battle, but that explosion hurts us, too! Oh, and when it powers up, that Attack power is 8, so watch out! Fire and explosions light its fuse, so I guess setting it off early is one strategy... You can run, too, but if you're gonna fight, beat it before it goes off! 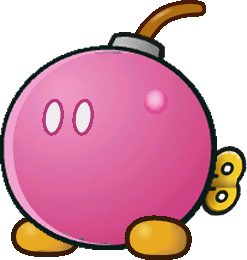 Bulky Bob-ombs are massive pink Bob-ombs in Paper Mario: The Thousand-Year Door. In battle, they utilize a series of stat-raising moves before finally exploding. The explosion cannot be guarded or superguarded. Hitting the Bulky Bob-omb at any time with a fire, lightning or explosive attack (except Clock Out) immediately causes it to explode, dealing two damage plus any accrued boosts to Mario, his partner, and all other enemies. The explosion causes other Bulky Bob-ombs to explode as well. They also appear as part of the audience (where they take up two seats), and may blow up and knock away everyone around them as well as scaring away any Punies. Stopping a Bulky Bob-omb in time halts its attack pattern, potentially allowing the defense buff to wear off before it boosts its damage and charges, or allowing both the defense and power boosts to wear off before it charges and self-destructs. Freezing it also prevents further attack progression, and also puts out its fuse at the same time, forcing it to spend a turn reigniting it. The fuse timer and attack pattern do not reset however. This page was last edited on April 20, 2019, at 15:22.